Traditional Gazebo Vs Covana: Which Type Is Right for Me? A gazebo is a great addition to your yard that adds comfort, style, sophistication, and a touch of luxury. They can be the focal point of your landscaping, an accessory for your hot tub, or simply add some functional beauty. The main benefits of gazebos — beyond their aesthetic appeal — are shade and privacy, but there are plenty of benefits and uses beyond those. 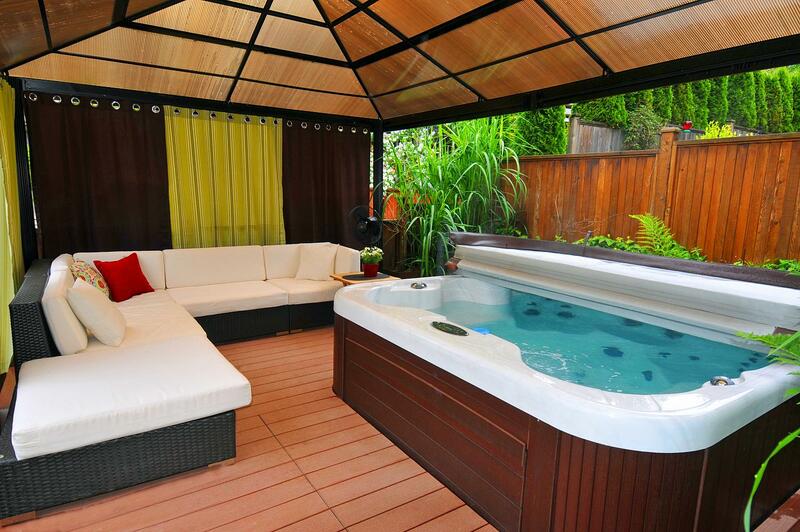 For hot tub owners, they offer a variety of options you might not have thought of. If you’re interested in taking your landscaping to the next level with a gazebo but aren’t sure which type or style is right for you, don’t worry. The many styles of gazebo available means you’re sure to find one perfect for your unique wants and needs. There are dozens of gazebo styles to choose from, but they all fall within a few main types to familiarize yourself with. Open air – The most traditional and uncomplicated gazebo style, simply consisting of support poles and a roof with open sides. Enclosed – This traditional style builds on the open air version with the addition of walls, windows and/or screens and a door. Covana – A new, innovative style that combines a traditional open air gazebo with a spa cover, creating a hybrid design. Before you get caught up in comparing the aesthetic details of gazebos, or even decide on which type you want, think about how you plan to use it. Of course you can use a gazebo however you want, but here are seven of the most popular uses. Spa enclosure – As we said, the main benefits of a gazebo are shade and privacy, which makes a hot tub gazebo the perfect addition to your spa. Lounging area – Whether you want shade, protection from insects, or a resort feel, just add patio furniture — or go all out with a cabana bed! Changing area – If you have a pool, swim spa, or hot tub, a gazebo makes a convenient place to change clothes. Shower area – Take things up a notch by installing an outdoor shower in a gazebo to rinse off before or after a dip. Outdoor dining – Cooking and dining alfresco is even better when you can enjoy the fresh air in a shaded, bug-free environment. Outdoor game room – This could simply be patio furniture and a storage shelf or trunk for games or larger additions such as table tennis or a pool table. Spa cover – In the case of the Covana, you can use your hot tub gazebo in place of a traditional spa cover to seal your tub when not in use. Which Gazebo Is Right for Me? Once you’ve identified what you want your gazebo for you can decide witch type will suit you best. Then you can dive into even more fun by browsing different styles for that type. Open air gazebos can be used for spa enclosures, lounging areas, and outdoor cooking and/or dining areas. They can also be used for a shower space to rinse off before or after a soak. Enclosed gazebos work well for lounging areas, changing spaces, cooking and/or dining, and game/recreation spaces. They can also provide a more private shower area. Now that you have a better idea of how you can use each type of gazebo and measured them against your needs, contact the team at Cal Spas of Minnesota to visit a showroom or get a quote! Still a bit unsure which is right for you? Our sales team will listen to your needs and help you to find the perfect gazebo.